Nilanjana Sikdar is a scientist and a member of Carlos’s team in Night Vale, which Carlos calls the most scientifically interesting town in the world. The team performs very important experiments, such as making machines that go flash and then bang, or measuring the effects of being disappointed in potatoes. Nilanjana does experiments that involve growing bacteria. It Devours continues the oddball comedy horror that the Welcome to Night Vale podcast and prior novel are known for, and it does a great job, as ever. Like the prior novel (and unlike the podcast) it does take the form of a more traditional narrative arc instead of being the shapeless semi-plotted form that the podcast takes. You don’t need to have listened to any episode of the podcast, nor read the prior book, to enjoy and understand this one, though you might miss a small amount of in-jokes. This one takes on one of my favorite topics, where science meets religion, with our two main characters being a scientist and a religious devotee, and has some interesting thoughts on the subject. 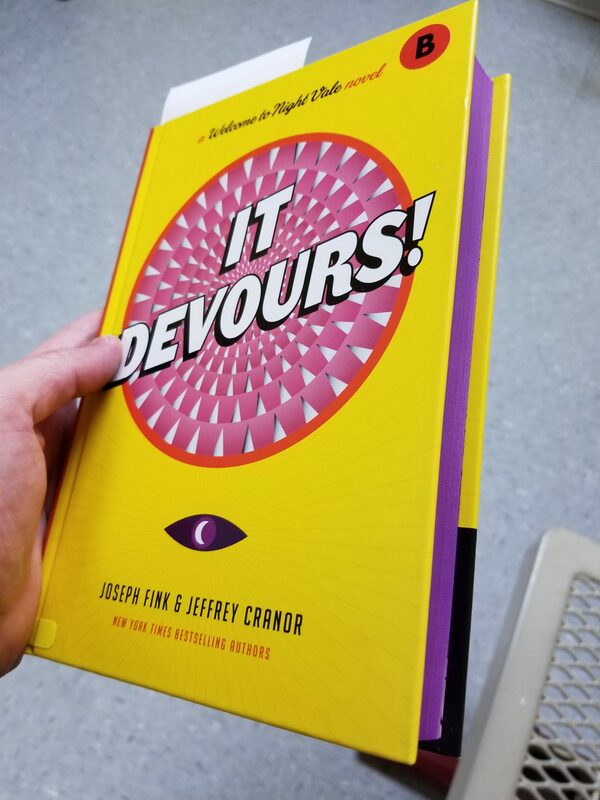 Also, I don’t often think much about book design besides just cover art, but this has a really eye-catching book design with the bright yellow cover, the purple-edged pages, and the toothy inlay. It is eligible for the Hugo and Nebula awards this year (and is on my personal ballot for each).